Book Review: "Surprised by Joy"
Janelle and Pam, this is for you. Thanks for keeping me on my toes and reminding me, however innocuously, of the important place writing needs to have in my life. This is me making time for it, even when life is crazy and the words seemingly won't come. I have been doing a lot of good, in-depth reading lately, thanks to the challenge set before me by a sweet new friendship God has brought to me. The selection I finished most recently came about as a result of a visit to Eerdman's Publishing Co. with said new friend, Adam. We found the place semi-monastic in its peacefulness, with a tall, cathedral ceiling; wide open, tiled floors; wall-to-wall and ceiling-to-floor bookshelves; and Gregorian-style music filling the air softly. Needless to say, for me, it was like a little piece of heaven here on Earth. I found a whole shelf devoted to one of my favorite authors, C.S. Lewis. I don't know how I even have the right to call him that, because up until this point, I'd read barely two of his nonfiction works, and yeah, his Narnia series. He offers so much more! 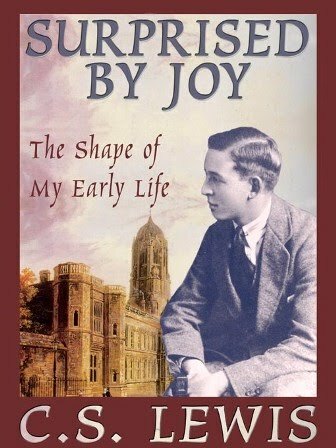 So, when I found one of the wooden shelves stocked with a generous helping of Lewis, immediately I latched onto the one I've wanted to read for years: "Surprised by Joy: The Shape of My Early Life." I haven't read any reviews of "Surprised by Joy," so I'm not sure if others instantly feel the same kind of connection to him that I have felt, but let me tell you, it was eerie the way he described himself in his childhood-- like he was describing what it feels like to be me. It wasn't the events themselves or the memories or even the circumstances of his family that were similar to mine; it was the things he valued, the fears he faced, the way he framed his thoughts, and the pleasures he found stimulating. These loves resonated within me. I wasn't born in Ireland, my mother didn't die when I was 6, I didn't have only one other sibling, I wasn't sent to boarding school or later assigned to a tutor named The Old Knock, I didn't invent a world called Animal Land with my brother, and I definitely didn't enter into the passions of boyhood and male adolescence. These were all the lot of Lewis. But I was and always have been a child of intense inner reflection, lost in my own world, more often than not feeling disconnected from those around me, experiencing my greatest, richest pleasures through the transport of literature, and only once in a very great while-- every few years, perhaps-- meeting a friend with whom I could really and truly feel connected. As much as I identified with the details, the big picture of C.S. Lewis' life was what stunned me. I never knew he experienced so much pain and isolation and emptiness. I had heard he met God in his mind after years of intellectual struggle. But, after reading the account of his early years, I am convinced God did something bigger. He met him on an intellectual battleground and waged a war with his heart. Lewis may have been fighting, but God won. If you want to understand the works of C.S. Lewis and what life ultimately meant to him, I think you need to read this book. CS Lewis = definitely a favorite author. And I'm not even that huge of a fan of the Narnia series! I am challenged, once again, to read this book. I don't know why I haven't yet. Whoa! I haven't blogged since Adam moved from "friend" to boyfriend! lol. Maybe I should do that.